The Filwood Quietway is proposed to link the south of the city with the centre. It is one of the main elements of the £19m Cycling Ambition Fund to upgrade walking and cycling routes across the city. There are four sections, with different characteristics, and different processes for consultation and planning: Whitehouse Street, Victoria Park, St John’s Lane and Wedmore Vale, and the Northern Slopes. The Filwood Quietway section of the TravelWest website has a lot of background and detail. The Victoria Park proposals were withdrawn ‘for further consultation’ in January 2017. We have submitted a response to the proposal for Wedmore Vale and St John’s Lane. Space for Cycling Does this measure deliver 1) Protected space on main roads; 2) Remove through motor traffic; 3) Safe routes to school; 4) Cycle friendly town centres; 5) Cycle routes in green spaces; 6) 20mph speed limits? Road Danger Reduction Does this measure seek a genuine reduction in danger for all road users by identifying and controlling the principal sources of threat? Update: Planning application withdrawn for ‘further consultation’. We will continue to press for ‘triple A’ ambition to make cycling feel possible for All Ages and Abilities. 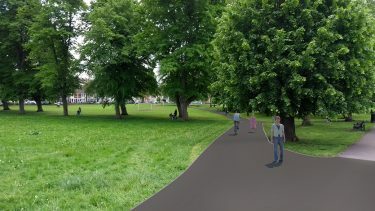 The consultation has now closed on the planning application for the Victoria Park section of the Filwood Quietway (however comments can still be made, use link here Victoria Park – say no to Project Fear). There are 1065 comments with a breakdown of about 56% objectors and 44% supporters (thanks to Kit Wallace for analysis). Interestingly, but not surprisingly, 85% of those living within 1km object. Those further away, and therefore more likely to consider cycling, are 82% in favour [updated 15/1/17]. We believe the proposals will improve Victoria Park overall and benefit everyone, walking or cycling, local or enjoying passing through, a real win-win. It will now be down to local councillors on the planning committee to decide how much weight to give local opposition when it goes against the wider interests of the City. 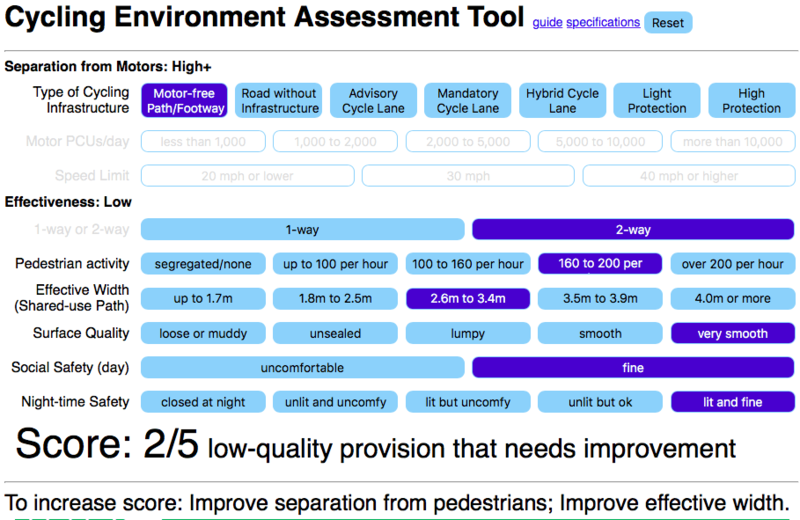 On a curious side note, in the review of 20mph areas in Bristol, the issue is ‘Just in My Back Yard’ or JIMBYism. Drivers are willing to curtail their speed where it matters personally, but revert to a habitual, faster speed where the benefits to themselves are less tangible. People want 20mph on their street so that it is safe for their children, their cats, their grannies but they don’t want to have to comply with 20mph limits in other people’s streets! Similarly, really good ‘Triple A’ cycling provision (All Ages and Abilities) that will attract and encourage more cycling is popular across the city, but changes are often vigorously opposed locally. 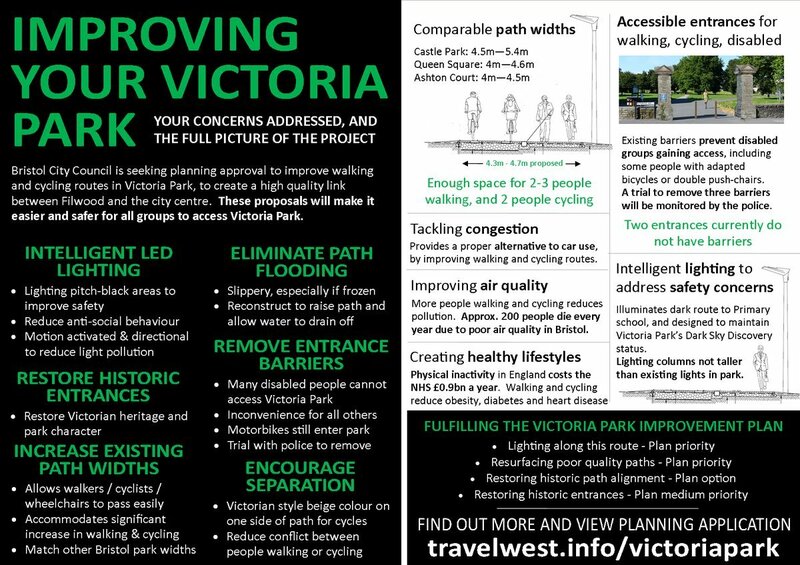 The planning application for the Victoria Park walking and cycling improvements closes tonight, Weds 11th Jan, but comments are still being accepted. We state again, this is good scheme utterly in keeping with everything that Victoria Park, and all other Bristol parks needs to have in a Cycling City (here’s a summary). Thanks to all who’ve voiced their support we’ve now got a more balanced position to the fear of change being pushed by objectors. But objectors still outnumber supporters. It’s not a referendum or vote but the numbers do matter. The application has been ‘called in’ by councillors for consideration by a planning committee. This will be real test for how far Bristol can be said to be ambitious for cycling. Use this link to send them an email saying you’re in favour. We’ve done most of the work but you should include your name and address and personal comments before sending. The issue seems to come down to whether you consider the status quo to be acceptable, or even pleasant. Our position is that the current position in Bristol is intolerable. People are suffering degraded lives through inactivity, poor air quality, traffic dangers and lack of access to green spaces. The hugely positive role that can can be played by cycling is impossible when two thirds of people won’t even consider riding a bike due to fear of traffic. To say ‘I cycle and it’s no problem for me’ is just not good enough.